Tunisian crochet is a unique crochet technique that is almost a combination of both knitting and crocheting. 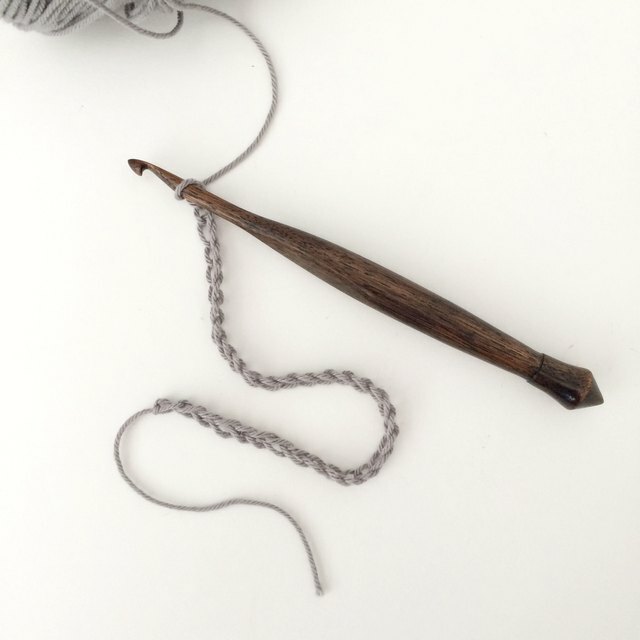 You use an elongated hook, and the stitches are linked and dependent on each other, much like knitting. 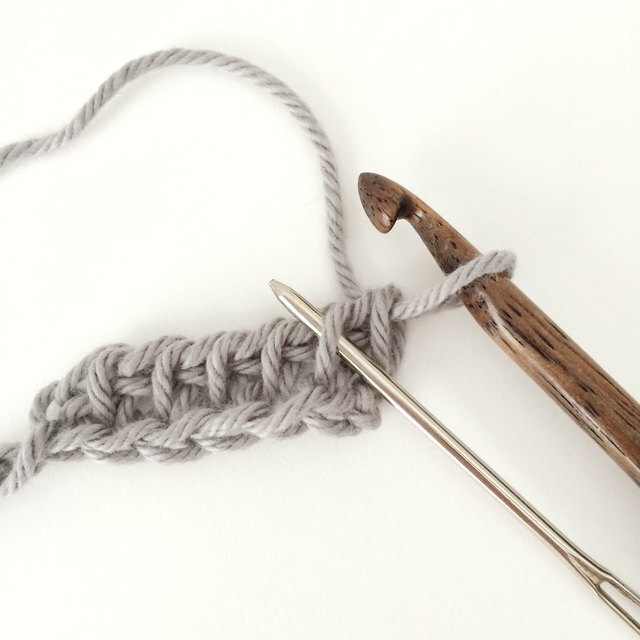 However, like crochet, you use a hook to loop and connect the stitches together. 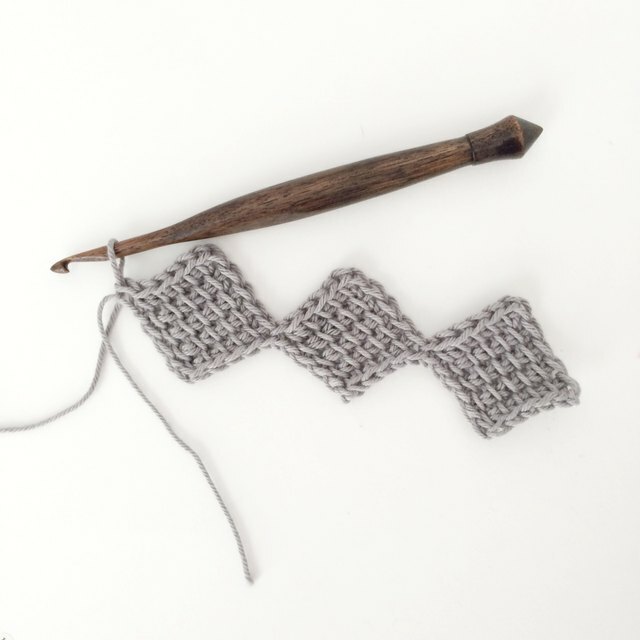 Tunisian crochet creates a waffle-like stitch with a distinct right side -- the smooth side -- and a wrong side -- the bumpy side. 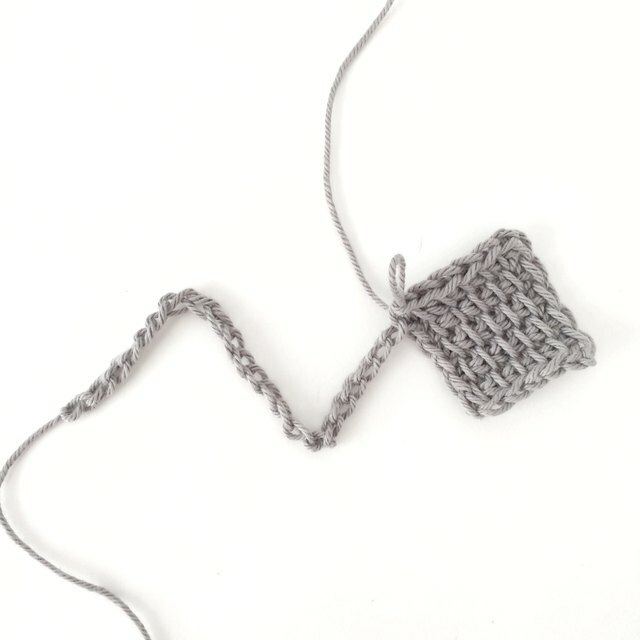 Entrelac, a technique of Tunisian crochet, is a "join as you go" method. 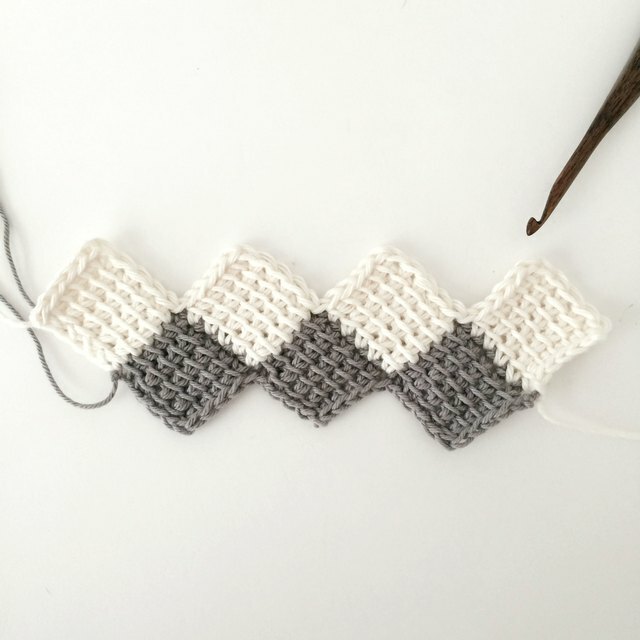 This makes it convenient for large projects with a lot of color changes, since it avoids your having to join and weave in as many ends later. 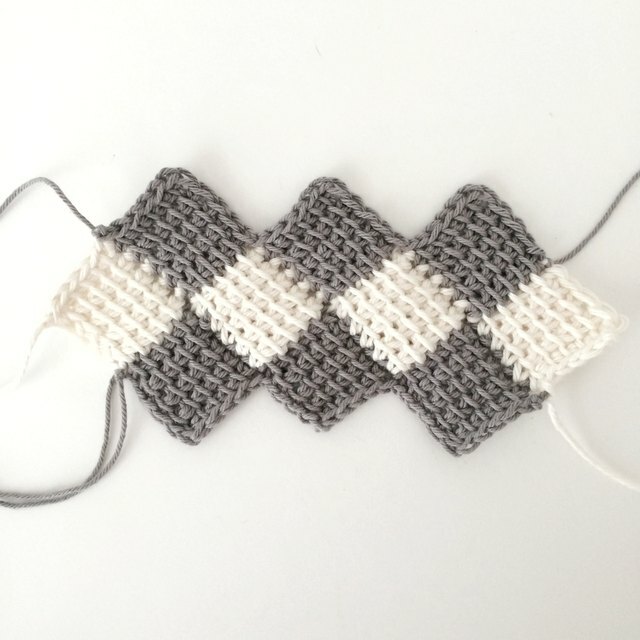 Many different shapes can be created and built upon using the Entrelac crochet technique, but the most common are square blocks. 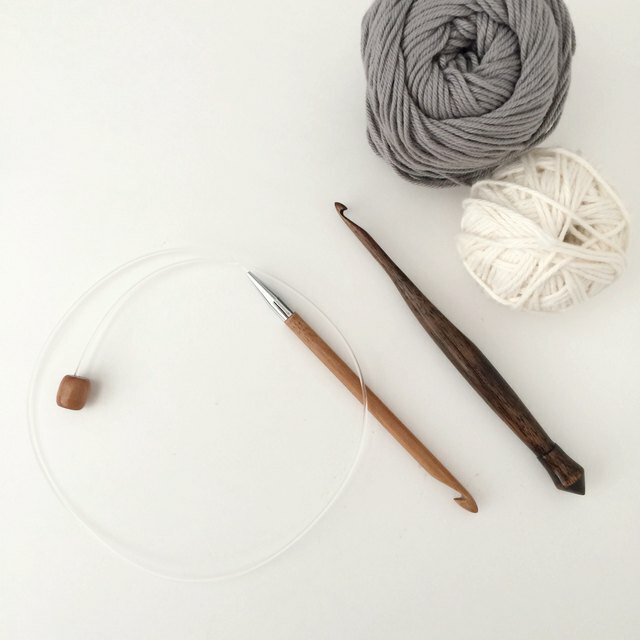 Both Tunisian and Entrelac usually require a Tunisian crochet hook, which is a crochet hook that has the same diameter for the entire length of the hook. You can find both in-line and tapered hooks in the Tunisian style, made with wood, plastic and aluminum. 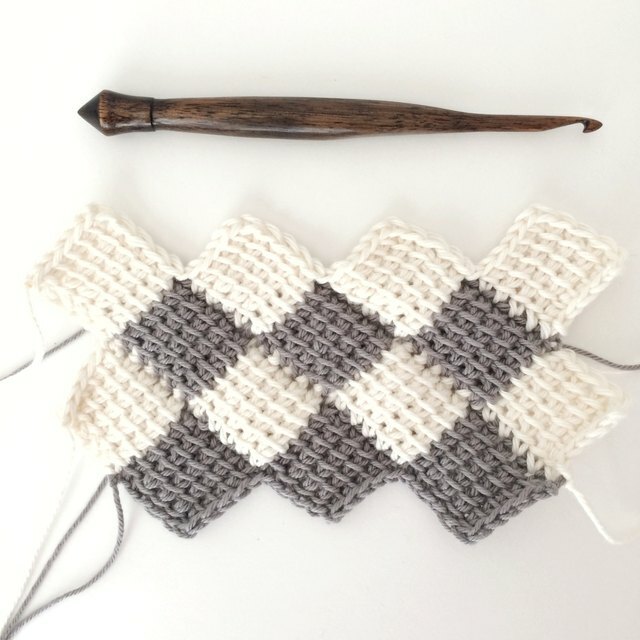 Tunisian hooks sometimes have an extended cable, which is convenient to use when you must put many stitches on the hook at once, as when crocheting some afghan patterns. 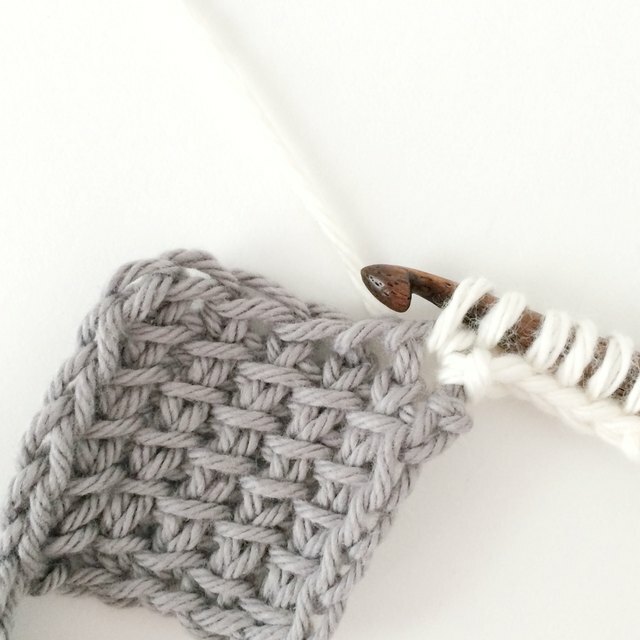 Use a hook that is two sizes larger than the hook usually recommended for the yarn, since using the normal size may result in work that is too tight. 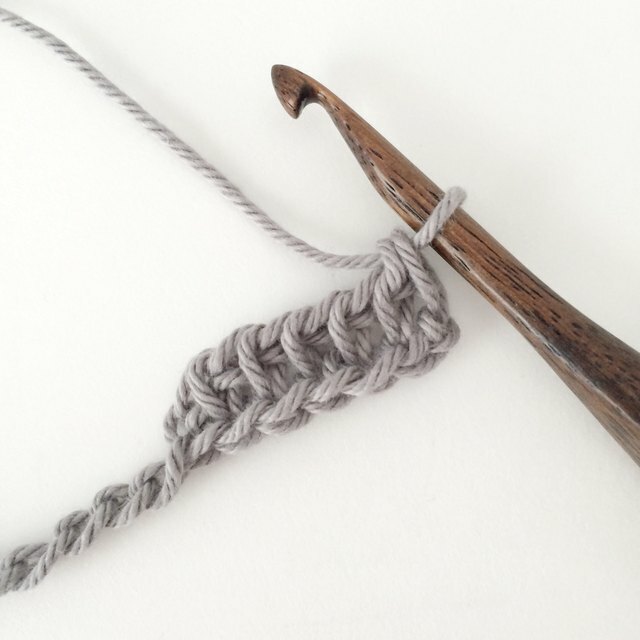 However, some patterns such as the featured pattern require only seven stitches on the hook at one time; therefore, your normal crochet hook should work. 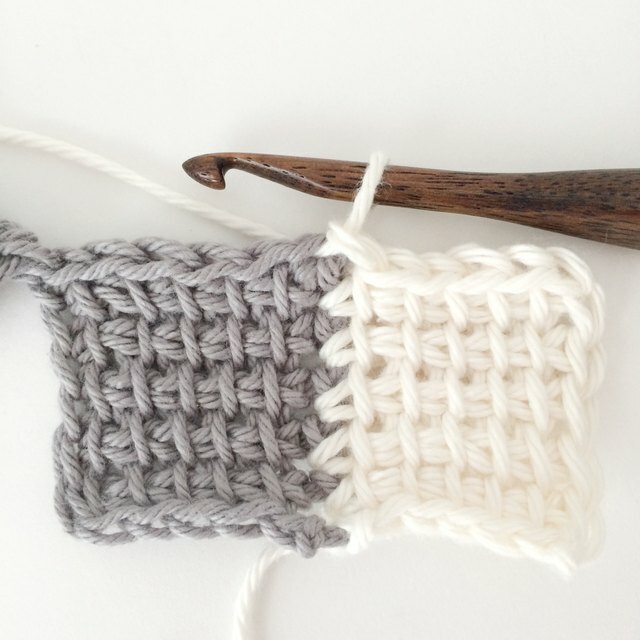 Check the pattern you are following to determine if an actual Tunisian hook is necessary. 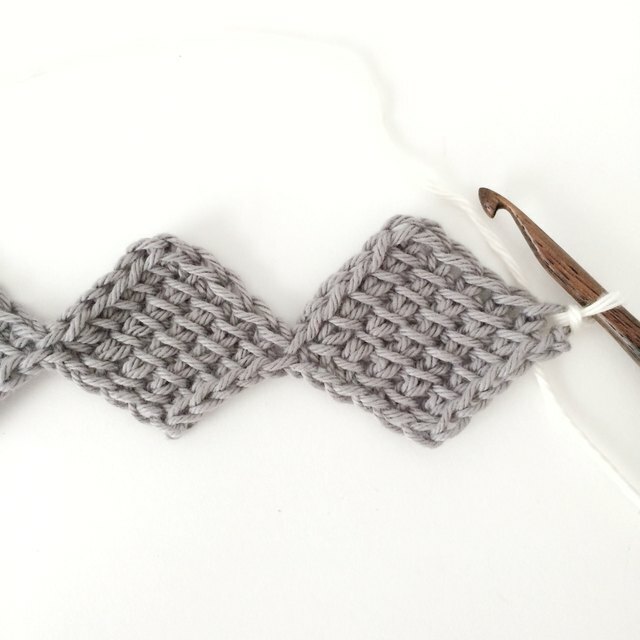 In the picture, you will see both a Tunisian hook with the cable and the hook used for the pattern, which is achieved using the Tunisian Entrelac method. The tutorial is a sample of Tunisian Entrelac. The steps are a sample based off this method. It is important to note that in this pattern you always want seven loops on your hook. Work the rows with the right side always facing. Each row of a block has a Forward Pass, or a picking up of stitches, and a Return Pass, which works the stitches off the hook. For this pattern, odd-numbered Entrelac rows have an odd number of blocks -- three. Begin by loosely chaining 34 (a multiple of 11 plus 1) to begin. Forward Pass: Working in the back ridges of the chain, pick up six chains by inserting the hook and drawing the yarn through. You will have seven loops on your hook. 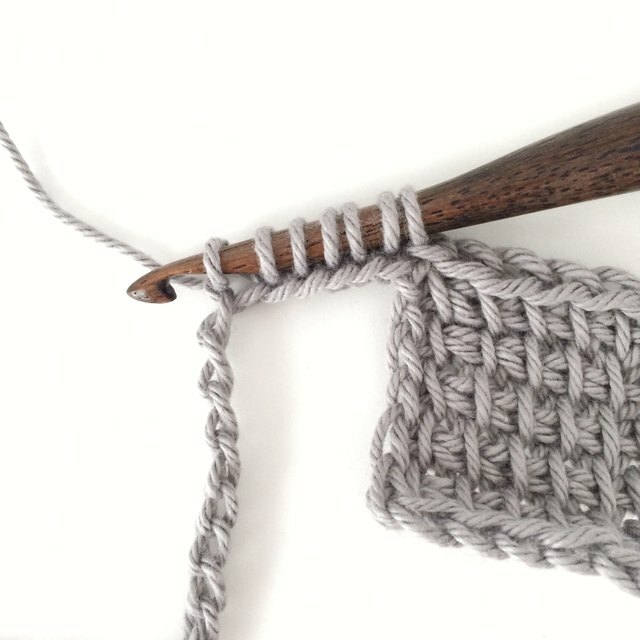 Return Pass: Yarn over and draw through two loops; repeat from across until one hook remains on the hook. Forward Pass: Keeping all the loops on the hook, pick up five vertical loops. The first vertical loop picked up is shown with the tapestry needle in the picture. After picking up the vertical loops, you have six loops on your hook, so you need one more to get to seven. The seventh loop is picked up from the back ridge of the next unworked chain from the base chain. Yarn over, draw a loop through, and you have seven loops on your hook. Return Pass: Repeat Row 1, Block 1, return pass. Loosely slip stitch in to the five vertical bars across. Sl st in the last loop of the foundation chain where Row 5 ended. The first block is complete. The picture shows how the base chain builds the sides of the blocks. Forward Pass: Pick up the next six loops from the back ridges of the base chain by inserting the hook and drawing up a loop for each chain. 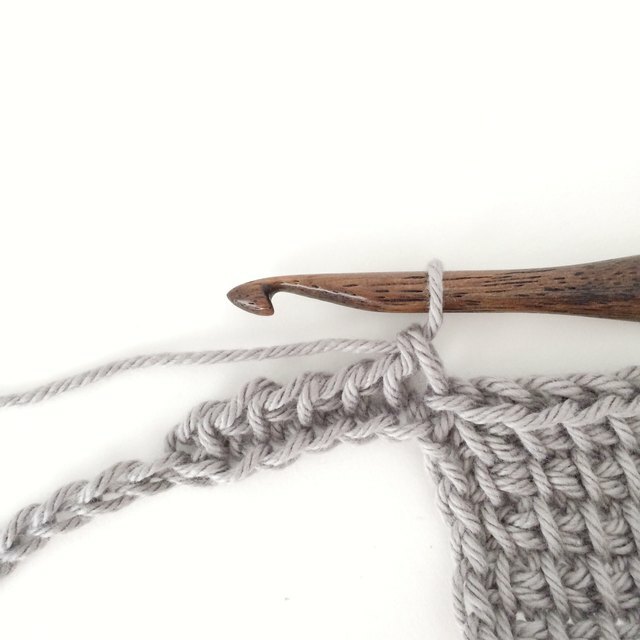 Return Pass: Yarn over and draw through two loops on the hook; repeat from until one loop remains on the hook. Repeat Row 2 through 6 of Block 1. Repeat Rows 1 through 5 of Block 2. (Last block of row) -- Loosely slip stitch in each of the five vertical bars across. Sl st in the same foundation ch as the last loop of row 5; sl st in the last foundation ch. Fasten off. 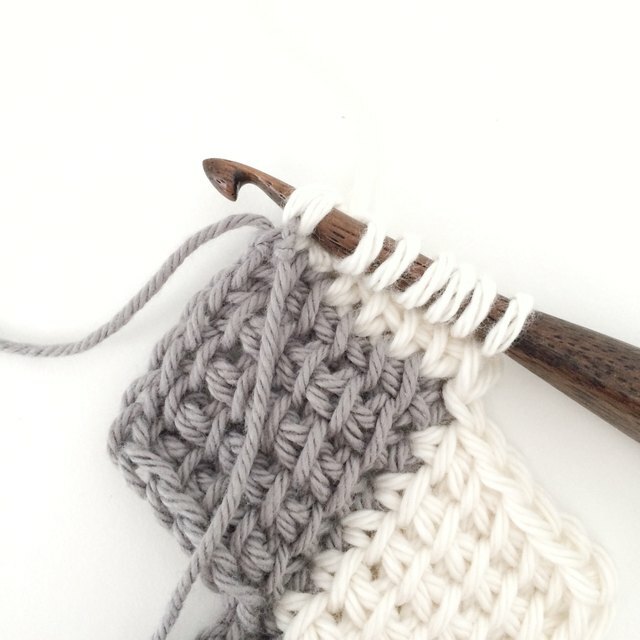 Join the contrasting yarn on the corner of the square as shown in the photo. Forward Pass: Chain 6, insert the hook in the back ridge of the second chain from the hook and draw up a loop; insert the hook and draw up a loop in the next chain; repeat from four times. 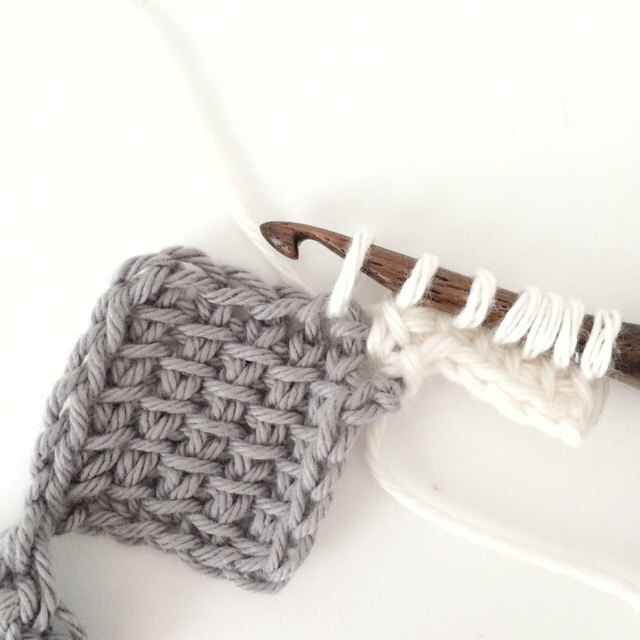 Insert the hook under both loops in the same spot where you joined the contrasting yarn and draw up a loop. You have seven loops on the hook. Return Pass: Rep Row 1, return pass. **Forward Pass: **Insert the hook through both loops of the next sl st and draw up a loop; repeat from five times. Repeat rows 2 through 6 of Block 1. Repeat the entire Block 2 for Block 3. **Forward Pass: **Insert the hook in the next st and draw up a loop; repeat from six times. You have seven loops on the hook. Return Pass: Yarn over and draw through one loop; yarn over and draw through two loops; repeat from until one loop remains. Pick up and draw loops through five vertical stitches; insert the hook under both loops of the chain at the end of the row and draw up a loop. Seven loops are on the hook. Loosely sl st in five vertical bars; insert the hook and sl st in both loops of the chain at the end of the row. Entrelac Row 2 is now complete. Join the contrasting yarn where the hook points to in the picture below. Forward Pass: Draw up the loops, five vertical stitches, and insert the hook in the row of the last Entrelac row; draw up the loop to make loops on the hook. Rep Rows 2 through 6 of Block 1 of Entrelac Row 2. Repeat Block 2, Entrelac Row 2. Loosely sl st in five vertical bars; sl st in same st as last loop of Row 5, and fasten off. Repeat Entrelac Rows 2 and 3 for a continued pattern.